Ever wonder what Lord Of The Rings would look like, if it was set in Brooklyn? Imagine no longer! 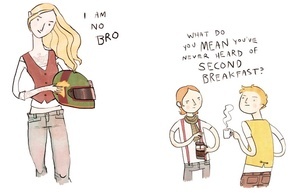 The amazingly talented Noelle Stevenson has illustrated a gaggle of endearing hipsterfied LOTR images. 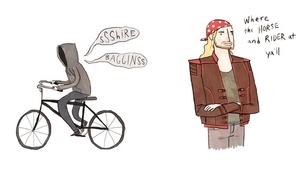 Above: Arwen Eowyn, the indie coffee-shop queen, hipster Merry and Pippin, hipster Nazgul on his fixie and an obscure poem from hipster Aragorn. Posted in Misc and tagged hipster, LOTR at 9:09 am on June 29, 2011 by Karl Monaghan.